Blurb: After six long years, kaRIN and Statik return with some of the richest and most rocking songs they have yet produced, making for an excellent entry in the Collide discography. It has been quite some time since the duo of Statik and KaRIN has graced our ears, but with this latest studio album, Collide makes strides to not only acquiesce to the demands of the loyal fan base, but to also throw in a few sonic surprises as well. 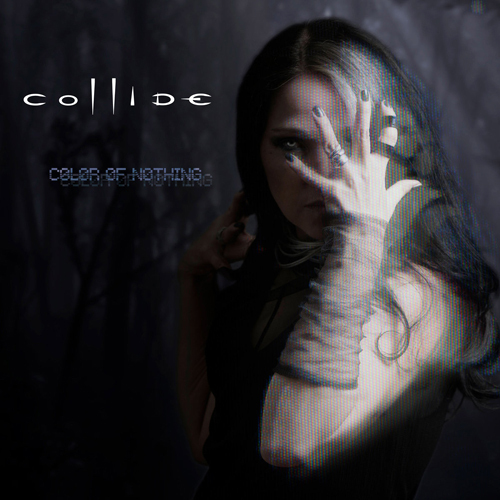 Always striding the fine lines between melodic gothic atmospheres and abrasive industrial textures, driven by kaRIN’s alluring vocals and a hard rock sensibility, Color of Nothing proves to be well worth the wait of six years since Collide’s last full-length release. A bouncy electro sequence and a light drumbeat enters, the animalistic buzzing of a heavily distorted guitar enters with a simple but effective lead, and as kaRIN’s sultry and almost anxious vocals come into the mix, “Wake Up” begins the listener through this album’s journey. Immediately, the song sets the stage for Color of Nothing, the caustic riffs gyrating with an almost classic rock & roll swagger that, though not rare in Collide’s music, hasn’t been quite so pronounced. For instance, “Will Not Be Destroyed” begins with an overdriven synth pulse, the downbeats striking like slaps to the face, and as kaRIN sings with the rhythmic soul of an R&B singer, everything begins to magnify into an almost psychedelic chorus of shimmering leads and clamorous riffs. And then there are songs like “Side to Side” and “Only Human” with their shuffle rhythms and gritty synth lines that evoke the sleazy ambience of a late night club, the guitars adding an abrasive strutting vibe that is simply delicious. Similarly, the percolating synth sequences and guttural rhythms of “Soul Crush,” the virulent bass synth and shotgun force riffs of “Say What You Mean,” and the crystalline layers of harshly resonant percussion and slivering synths, bass, and cool piano on “Pale Blue” all showcase Statik’s ever intricate blend of complex programming with organic instrumentation. On the other hand, “Intruder” and “Fix” are classic Collide as they move with darkly sensual grooves that are at once bluesy, ambient, and mystical, while “Freaks Me Out” is almost funky, the strangely repeated and somewhat offbeat reversed guitar phrase adding an appropriately disconcerting atmosphere to the song. Collide has never been a band to rest on its laurels or allow itself to become complacent; Statik and kaRIN always seem to be striving for excellence, usually with varying degrees of success. With Color of Nothing, the band has achieved a bold new standard of darkly melodic songwriting coupled with a truly industrialized rock aesthetic that we’ve rarely heard since the advent of ‘90s coldwave. This is not just another album in Collide’s discography, drawing on the sounds we’ve heard before from Chasing the Ghost or Some Kind of Strange, nor is it an outright reinvention of the band’s sound; more of a revitalization with even richer songwriting and production. The band has crafted a sound that is identifiably its own, but with this album, all of those elements are strengthened and amplified to such a degree that it may stand as some of the best music Collide has yet offered.